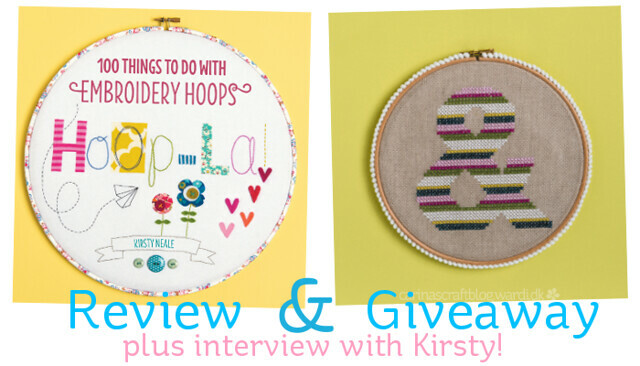 Hoop-La review and interview – oh and a giveaway too! So when Kirsty asked if I wanted to be part of her book blog tour, I was excited to see what she had come up with and I had to ask her some questions about the book. And I especially wanted to hear about how she kept track of all those projects. Here’s what Kirsty had to say. I really like the projects that go beyond the “fabric project framed in a hoop” concept, how did you develop these projects? The Dear Diorama, for example. 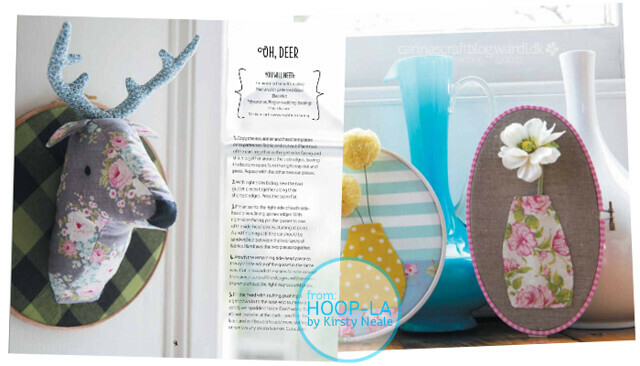 And Joined at The Hip project – I’d never have thought of using hoops like that! Although I really enjoyed making all of the hoops, those more high-concept ideas were definitely some of my favourites to dream up. I spent quite a lot of time sitting with a hoop in my hands, squinting at it from different angles to try and get some visual inspiration (definitely one of those times when working on your own is an embarrassment-free advantage!). That was the starting point for things like the diorama and mirror projects, which both use what is normally the ‘negative’ space behind the hoop. For other designs, such as the stag heads and bird mobile, it also helped to think of the hoop as a starting point, rather than a container for the project. The book introduces quite a few needlework techniques – how did you decide which ones to include? They’re a mixture of techniques I use quite often (such as appliqué), things I haven’t done since A-level textiles (like redwork), and one or two techniques (hello, chicken scratch) I’ve wanted to try out for a while. I was keen to demonstrate the range of work which can be framed in a hoop, and it was also a terrific opportunity for me to explore different techniques. Hopefully – and even more importantly – it will provide inspiration for readers to do the same, and maybe find a new technique they really love. Did you ever feel like, say when you had 64 projects, you’d never be able to get a 100? Did you think you would run out of ideas? 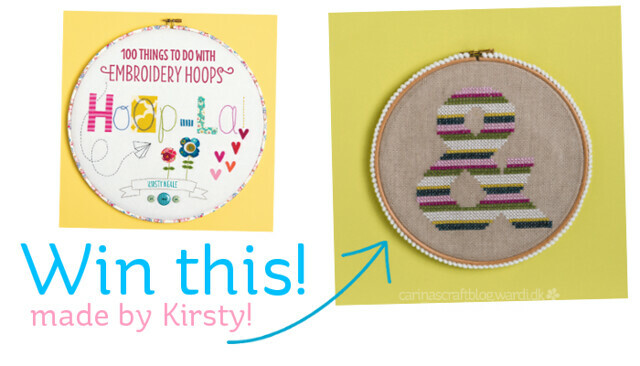 There were only around 35 projects on the original proposal I sent to the publisher, and it was actually my editor who suggested it would be fun to make it ‘100 Things To Do With Embroidery Hoops’. I think I got to around 70 before it even felt like a struggle, but I was much too stubborn to contemplate giving up! Switching from my laptop to a sketchbook was really helpful – lots of extra (and different) ideas came from drawing, rather than just imagining and writing things out. I also think ideas tend to be self-perpetuating – the more you write down, the more fresh ones pop into your head. It’s one of the few times in life when having an obsessive kind of nature can be useful. How did you stay sane coming up with this many projects – and how did you keep track of them all? Any tips for tackling big (crafty) projects? I’m usually the kind of person who keeps track of things in my head – I don’t have a diary or calendar of any sort. I often scribble down lists when things get busy, but I knew a project like this needed a bigger plan than I’m used to. 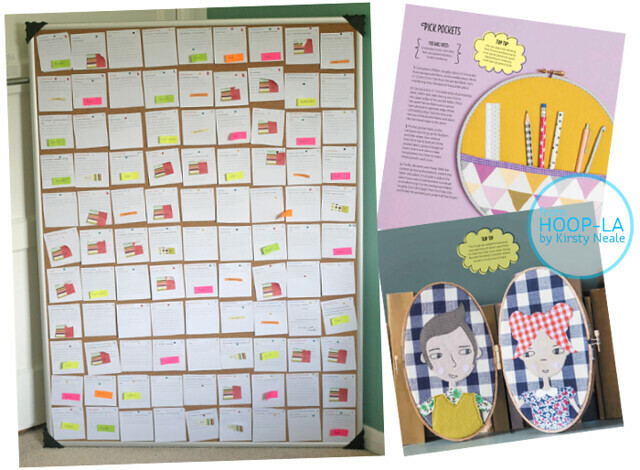 I ended up buying a giant corkboard and a stack of coloured Post-it notes, before printing and cutting out the details of each hoop from the bookplan. The board was just about big enough to fit all 100, and the colour-coded Post-its were added on top to help keep track of the different hoop-decorating techniques, so we had a good balance. Pulling off each note as I finished the projects was both satisfying and a good visual reminder of where I was in the process (half-empty board equals halfway done!). It was also really helpful to be able to see everything at a glance, which you obviously can’t do with a sheaf of notes or a Word document. Although it can be a little daunting at first, I’d definitely recommend this kind of system as a way of breaking a big project down into smaller chunks. It’s inexpensive, low-tech, and you start to see progress from the minute you take down the first task. It’s impossible to pick just one favourite, but as you’ve worded the question so cleverly, I’m going to say I’m really glad we included the modular flower. It was pretty tricky to engineer, but oh-so satisfying once I eventually managed it, especially because it worked out exactly as I’d imagined. The same is true of the stag heads, and I’m also happy with the solar system hoops – craft books definitely need more science-y stuff! Whenever possible, I like to make something from a book I am reviewing, and I have from this book. More about that below. First a wee introduction to Hoop-La. The vast majority of the pages are occupied by the projects, but at the start of the book there is a section which covers materials and equipment. 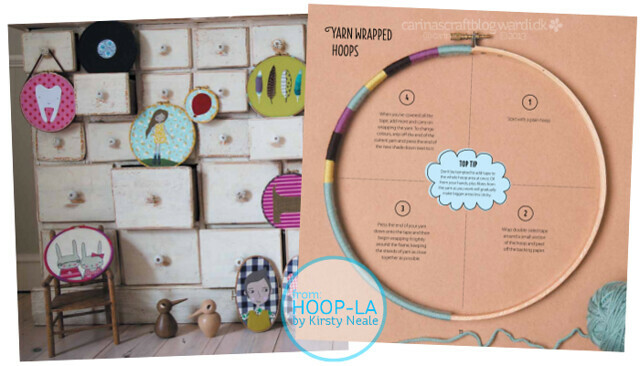 There are also several pages with ideas for decorating the hoops themselves: painting, washi tape, crochet and more. I really like this section in particular. It’s not that often you see hoops decorated, apart from maybe a lick of paint. So I actually found this very inspiring. I had a go at making the stag head you see in the picture towards the top of the post. When I saw that in the book I just had to make it. I’m not a fan of taxidermy, but a fabric stag head is ok! Unfortunately, making the stag head wasn’t completely straight forward. I ran into a wee bit of a problem before even starting, because the templates for the stag were not at full size and there were no instructions for sizing. My initial print (since I only have the PDF version of the book, I can’t say for sure about the printed version) of the template was way too small compared to the size hoop it is supposed to go in. With a bit of comparing and measuring I was able to figure out that it probably had to be enlarged by 200% (and a very helpful email from Kirsty confirmed this). Sewing the stag head together was ok, except for some missing ‘point A and B’ indications. Not a big problem, but if you’re a complete beginner to sewing it would probably confuse you. One thing I hadn’t really thought about before starting was that in the ‘materials needed’ list, there wasn’t any instructions for how much fabric was needed for the different parts. When I got to making the backing for the stag head, I would obviously need a piece of fabric larger than the hoop, but it doesn’t specify how much larger. I think it would have been really helpful to have this information to begin with. And it seems to be the case throughout the book that generally that information about fabric size/amount is missing. I know a lot things have to come together to make a book, so maybe this was an oversight? Apart from these issues, it was a fun little project to put together. Well, almost put together – I need to get some pipe-cleaners to finish the antlers. 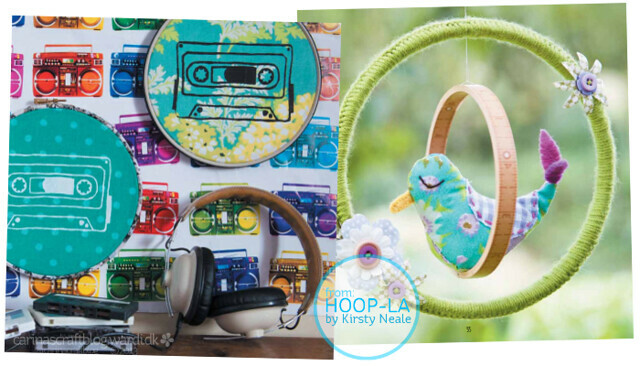 Here you can see where else you can visit the blog tour for Hoop-La. Kirsty is kindly giving away some of the projects she made for the book and you can enter right here for a chance to win this ampersand project. I love a nice ampersand, don’t you? ♥ Leave a comment on this post. I’d love to know what unusual projects you have made using embroidery hoops. But answering this is optional. ♥ There must be an easy, straightforward way to contact you if you’re the winner of the giveaway. Email address, Twitter @, Flickr name or a link to your blog where I can easily find your email address. I will not notify the winner via comment on your blog. ♥ Giveaway is open to anyone anywhere. ♥ Anonymous entries can not be accepted. The giveaway closes on Sunday (November 10th) at 10am UK time. The giveaway is now closed. Thank you for entering! The winner will be announced shortly.